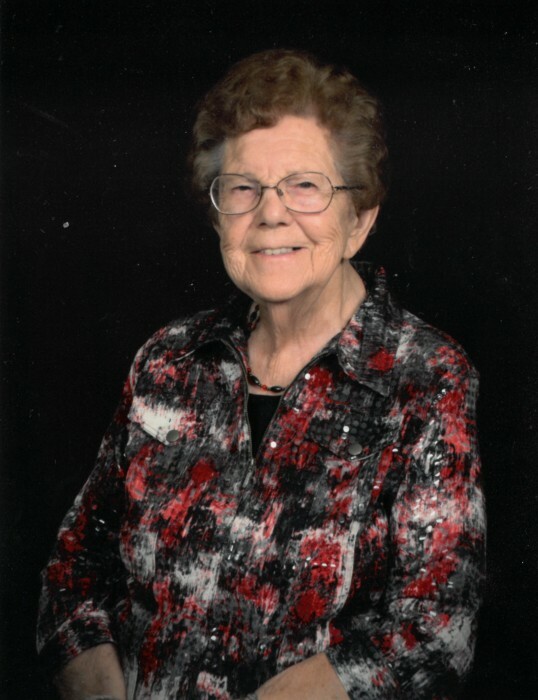 Dorothy L. Holthaus of Cresco, Iowa died after a brief illness on Wednesday, January 30, 2019, at Regional Health Services of Howard County in Cresco, surrounded by her loving family. A Mass of Christian Burial will be held at Notre Dame Catholic Church on Monday, February 4, 2019, at 11:00 a.m. with Father Dennis Cain officiating. Burial will be in Calvary Cemetery. Visitation will be held on Sunday, February 3, 2019, from 1-4 p.m. at Notre Dame Catholic Church, and will continue at the church for one hour prior to the service on Monday. Hindt-Hudek Funeral Home is assisting the family. Dorothy Ludmilla Winter was born June 12, 1923, to Louis and Johanna (Balk) Winter on a farm by St. Lucas, IA. Dorothy attended school up to 8th grade. At the age of 13 she worked as a hired girl, taking care of many new moms with their babies. Dorothy married Severin Holthaus at St. Mary’s in Waucoma on October 6, 1947. To this marriage 6 children were born, Donald, Earl, Shirley, Allen, (twins) Steven, and Sharon. Severin and Dorothy farmed east of Cresco for 35 years. Dorothy worked on the farm and cooked and baked for the family. She was a member of Notre Dame Altar Society, American Legion Auxiliary, and hospital auxiliary. Dorothy is survived by 2 daughters Shirley Kleve, Sharon (Kevin) Gerleman, 2 sons Allen (Brenda) Holthaus, and Steven (Kim) Holthaus, daughter-in-law Connie Holthaus, grandchildren Theresa Kleve, Jenny (Ray) Rankin, Rod Kleve, Rachel (Rod) Vsetecka, Sarah (Matt) Halweg, Devin (Alexa) Holthaus, Kyle (Stephanie) Hovden, Chris (Chelsey) Hovden, Paige (Jordan) Schumacher, Lacey Holthaus, Adam Gerleman, Grant Gerleman, and Reece Gerleman, 13 great grandchildren, 3 sisters-in-law Caroline (Joe) Schildmeyer, Lillian Holthaus, and Doris Winter, and numerous nieces and nephews. She was preceded in death by her parents, husband Severin in 1983, son’s Earl 1968, and Donald 2009, son-in-law Melvin Kleve, in-laws Felix and Agnes Holthaus, her 6 sisters and their spouses Agnes (Lewis) Appleman, Evelyn (Clarence) Schmitt, Veronica (Linus) Schmitt, Marie (Merle) Schissel, Helen (Greg) Heying, Irene (Roger) Moellers, her 5 brothers and their spouses Leonard (Nadine) Winter, Clarence (Leona) Winter, Leo Winter, Don (Carol) Winter, Linus Winter, brothers and sisters-in-law and their spouses Augustine (Ethel) Holthaus, Ralph (Olivia) Holthaus, Rudy (Germaine) Holthaus, Francis (Luella) Holthaus, Joe Schieldmeyer, Rosemary Holthaus, Agnes (Ed) Riha, and a great-grandson Bryson Holthaus.